Every chance I have, I bring my children from South Carolina to the Celsius Tennis Academy. Among numerous tennis academies in the Sarasota-Bradenton area, we decided to put the tennis faith of our two children in the hands of Cary Cohenour and his team of coaches. Celsius coaches focus on developing confident, hardworking, tournament ready players. The coaches focus on each individual player and continuously communicate to each other, and to the parents, about a player’s progress. Celsius coaches nurture all stoke skills, drill the movement, and foot-work speed. The fitness and emotional skills of a player are also developed and nurtured. We are so fortunate to have the opportunity to train at Celsius Tennis Academy and to expose our children to such a passionate and persistent team of coaches. I am a private coach of several kids in the southern Illinois area, with ages varying from eight to eighteen years of age. 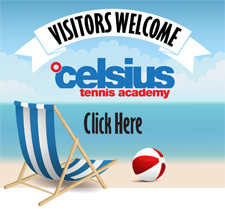 I recently sent three of the kids I coach, one of them being my daughter, to Celsius Tennis Academy for four weeks. After speaking to and asking each of their personal opinions, all of the kids came to the agreement that is was a great time and feel that it was extremely beneficial in various aspects of their game, both physical as well as mental. They feel that the great and talented coaching staff, hours of training both conditioning and playing, and all of the available levels of players and groups contributed to the amazing experience that this became. In effect to this, my daughter as well as several other kids of whom I coach plan on attending next summer as well. I used to coach Cary back in the day. He has a solid foundation for developing young players and a great methodology. His kids are focused and dedicated. I love coming to hit with them when my schedule takes me to North America. It takes me back to why I became a coach in the first place… Exceptional program with an exceptional staff. Uniqueness of Celsius Tennis Academy is in the fact that the director of the Academy Cary Cohenour managed to collect a balanced team of like-minded, enthusiastic coaches that entirely dedicated themselves to the common goal. Along with the high professional level tennis training, students can always count on help and advice on many aspects of life. Victory and defeat, the ups and downs always perceived the same way – with a deep analysis, a positive attitude to everything going on, and an unshakable faith in yourself! At the Celsius Tennis Academy, we have found that our kids Talia 13, and Sofiya 9, are exposed to the highest level of tennis instruction in the area. Living in Tampa, we travel the hour drive several days a week because of the quality of the overall tennis experience here. Our girls have made lasting friendships with the kids at Celsius and have a the utmost respect for their coaches, who support and care about their success in tennis and in life. My two sons attended Celsius Tennis Academy for eight years. In addition to receiving full athletic scholarships to college, the Celsius program taught them discipline, focus, a strong work ethic and the desire to be the best you can be. These are attributes that served them well in competitive tennis and will continue to do so in whatever they endeavor in life. We appreciate the hard work and dedication of the coaching staff and are grateful to have been a part of the Celsius family. Celsius develops great junior tennis players. The program is deep and the staff dedicated with very low turnover. I love their commitment to developing players at a young age and their belief in just the right balance of competition. Celsius is a great fit for us and has taken our son Andre from the age of 12 to a top 3 USTA Florida ranking in two age divisions to a Division 1 scholarship, sportsmanship, confidence, dedication and a sport for life! Visiting juniors to Sarasota are welcome to train at Celsius by the day, week or month. Please refer to the Drop-In section on our programs page for pricing.